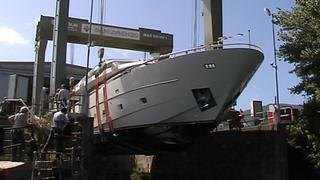 News now in of the ninth launch from the yard so far this year as Sanlorenzo saw its latest build, the 28.6m motor yacht SL94, hit the water yesterday, August 30th. Inspired by the successful SL104 series which introduced an evolution in the Sanlorenzo style, the SL 94 has large windows and portholes bringing natural light inside and has contemporary lines to her silhouette. Designed by Francesco Paszkowski and the in-house team, this 28.60m motor yacht was built in composite at the Ameglia shipyard of the group. Special features include a flybridge (with hardtop as an option) that’s free of a tender thanks to the presence of a large stern tender garage. The SL94 has a modern interior designed by Francesco Paszkowski with a layout accommodating eight guests on the lower deck in a full-beam open plan master suite, a VIP stateroom and two twin cabins. In the engine room, two options are possible, two 1,415kW Caterpillar C-32 Acert engines giving a top speed of 27 knots and a cruising speed of 25 knots, or twin 1,630kW MTU 16V 2000M92 with performances between 26 and 29 knots. The SL94 will have her worldwide première at the Yacht Club de Monaco on 23 September and will also be available to view at the Genoa Boat Show in early October.